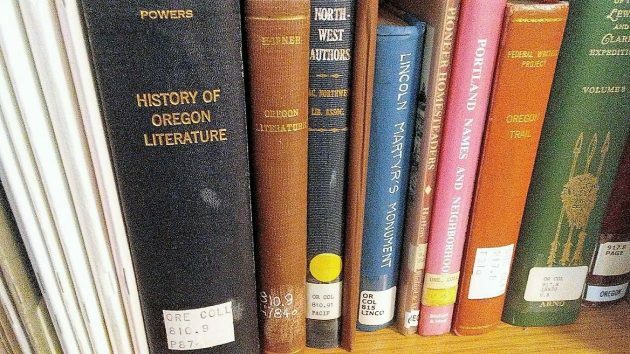 The History of Oregon Literature on the left is a treasure all by itself. The collection is not big. But it is varied. What really caught my attention was an 800-page “History of Oregon Literature” by Alfred Powers which came out in 1935. It’s full of great stuff, including a long public letter in 1871 by Minnie Myrtle Miller on the occasion of husband Joaquin Miller returning to Oregon after many years away and leaving his family to nearly starve. 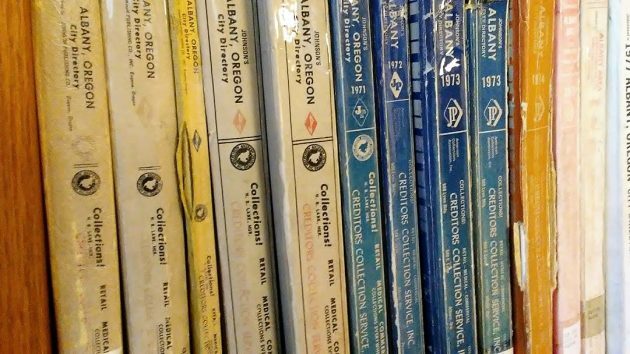 Some of the Albany city directories stored in the Carnegie Library’s collection on Oregon’s history. Timeless and appropos for many occasions. Ancestors, long departed lived in Albany in the late 30s. Maybe I can divine the year. By the time Mom told the story, her time concept was fuzzy. The family lived in a building named “The Lyon.” She walked to school and was impressed by the cannon in the nearby park.